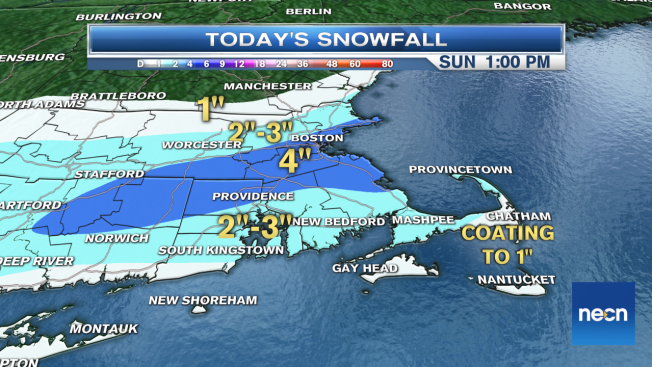 Coverage of our wind and snow blitz on NECN Sunday morning focuses on the timeframe through 11 a.m. by which time most of the action will have shifted offshore. The morning hours, however, deliver thundersnow with 1 to 2 inches per hour rates, near zero visibility with near-blizzard conditions in brief bouts, and a howling north wind that will gust to 60 mph on Cape Cod and 50 mph in parts of Southeast Massachusetts. When all is said and done, either side of four inches will have fallen on grassy surfaces from northeast Connecticut to the Massachusetts Turnpike Region and South Shore, with lesser amounts on Cape Cod and also to the north from the Merrimack Valley northward. Power outages are a concern in Southeast New England, especially, where strongest winds will howl, but during the afternoon, a general wind gusting over 40 mph will encompass most of New England, meaning isolated power outages are possible this afternoon, even as the sun breaks through. Of course, cold air will remain in place, with highs struggling to exceed 40 and wind chill values in the 20s. Some black ice is possible tonight, then another storm system impacts the region Monday. The Monday system won't bring quite such intense snow, and the timing starts during the early morning, lasting through the day, so relatively strong April sun through the clouds will limit impact on roadways, and likely cap Monday accumulations at about one to three inches.